Ye Shiwen, 16, Gold Medal 400m Medley Swim. The Hillsborough disaster was a human crush at Hillsborough football stadium in Sheffield, England, on 15 April 1989; with 96 dead and 766 injured it is the worst disaster in British sporting history. The victims were overwhelmingly from the working class. On June 21st, 1964, an ecstatic crowd of 120,000, awash in a sea of red and yellow, cheered and applauded Generalissimo Francisco Franco as he stood up to leave the Madrid summer evening gathering. 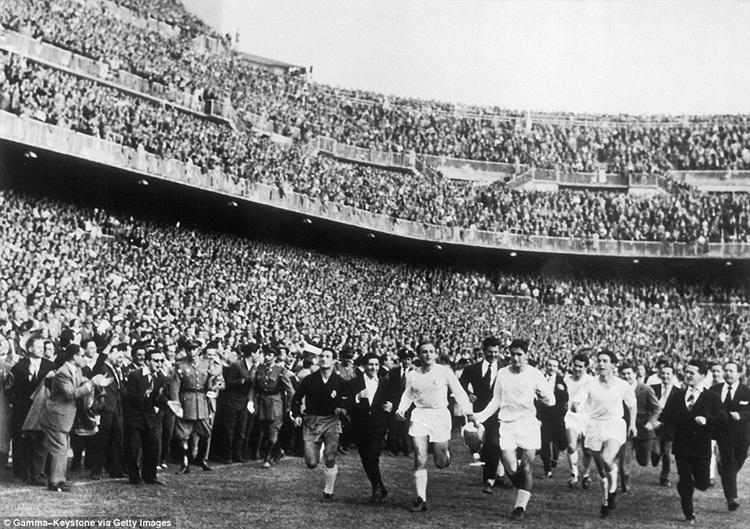 This was no mass rally of political affirmation that the dictator was leaving, but a football match. Spain had just beaten the Soviet Union in the Final of the European Nations’ Cup; so much more than just a football victory: a triumph for international co-operation over Cold War hostility, but, conversely, perhaps also a triumph over the old Red enemies of the Civil War. Not even organized baseball escaped the many-faceted, relentless undeclared war the U.S. government has been waging against Cuba for the last almost half a century. New York Times (February 1) – There was just one witness to the moment Kenny Sailors helped revolutionize the game of basketball — his brother, Bud — but by all accounts no one has ever doubted their story.